Back to School Prep? Check! The $50 is a pipe dream and dropping her off at the mall isn’t very practical since it takes 30 minutes to get to the mall from my house but I was inspired to try something new based on Dave’s suggestion. I gave Hannah $100 and told her I was going to sit and knit on one of the couches in the center of the mall while she did her shopping. I gave her some basic guidelines and said if she bought anything inappropriate then it would be returned and she wouldn’t be allowed to choose a replacement but that if she chose wisely and bought good things then I would reward her. 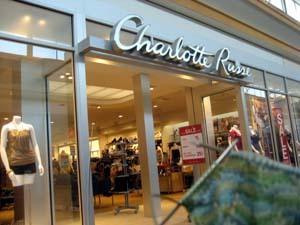 So I sat outside Charlotte Russe and American Eagle and worked on my Monkeys. Hannah shopped long enough for me to get to the toe decreases and when she came back she had bought a pair of jeans, 3 shirts, and a bracelet. Everything was appropriate and I rewarded her by taking her back into one of the stores and buying her two more pairs of jeans. 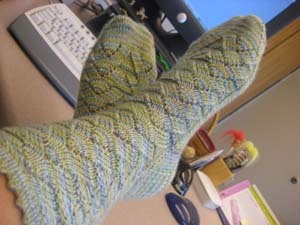 I’d knit these again in a heart beat and now I understand the love of this pattern. For those wondering, the yarn is Yarn Love Juliet in the colorway Belle from where else but The Loopy Ewe. 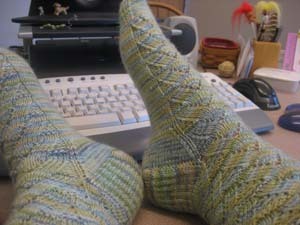 It’s a great match for the pattern and I’m very pleased with these socks. They are for me, of course. After all that back to school prep, I think I deserve a reward. If I had to participate in back-to-school shopping, I’d definitely follow your lead. Brilliant idea! 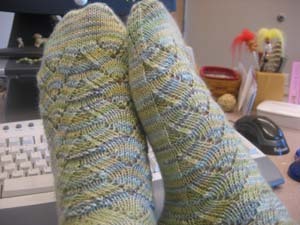 The socks turned out very nice!